The funny thing about trying to use up what you have for yarn, is that sometimes you don’t have enough yarn for the project you are currently working on! This is the case with the shawl I have been working on. It is a common enough yarn that I am sure I can get more of it at the store, but for the time being, I am not working on it. 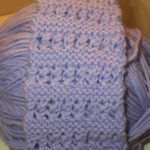 Instead I started knitting my purple scarf again. I am really enjoying the simple pattern of the scarf. And then, as I was perusing on pinterest, I found a really cool braided scarf pattern. I thought that the scarf pattern I was using would work well with a braided scarf (which I had never thought of before! ), and so now I am working on making three pieces to braid together. Granted, I am still working on the first piece, but now I know where I am going with this scarf, and that makes me happy. Reading, well, I have gotten several books in the mail recently, which of course I am so excited about! Unfortunately, I still have a stack that I am trying to work through before I can start on my new ones. I just finished Until You, which is still free for Amazon Kindle. It is a good suspense/contemporary book, and a quick read. I have also been reading Prayer: Finding the Heart’s True Home and The Briarpatch Gospel: Fearlessly Following Jesus into the Thorny Places which are both kind of heavier reads. So, it is always nice to have something easy and carefree to read when I need to take a break from all the seriousness! I finished Project-Based Homeschooling: Mentoring Self-Directed Learners last week, and I loved it. I think the title is a little strange, because I felt like the author was writing to teachers, instead of homeschoolers. The author had a lot of great ways to incorporate project based learning in a classroom setting, but also related it to parents working with their kids at home. I think this book would be great for anyone that has kids that are in school/homeschool/will be in school 🙂 It has really caused me to re-evaluate the current flow of our home, and I am now trying to make some changes to make it easier for my kids to explore what they want to explore. Really interesting information! 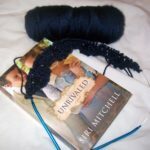 yarn along and new book! Thanks for stopping my blog, I'm visiting from the BMB party! 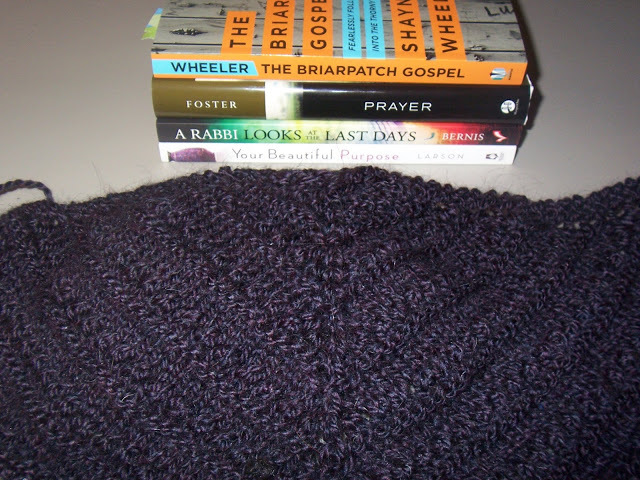 Briarpatch Gospel sounds like a good book and love the knitting, it's beautiful. visiting via BMB party. Beautiful color for your shawl — and I can so relate to having a pile of books to plow through! Hey, I just popped over from Lisa & Nancy's Valentines BMB party. I love the rich purple color of your scarf and the braided pattern sounds intriguing. I can't wait to see the finished product. Looks like you are a busy bee these days! 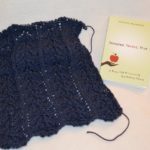 Good books and beautiful knitting, the new scarf sounds lovely! I love the color of the yarn in the picture. I hope you find more. I just ran out of yarn on the socks that I'm knitting from stash so I know exactly what you mean. I tried shortening the socks, but I still haven't enough so I went ahead and ordered more. So I started with 100gram of yarn and at the end of this I'll still have 85-90 grams 🙁 Oh well, at least I love the colour. Your shawl looks toasty warm. I'd go ahead and buy the extra yarn to finish it! 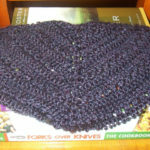 I hope you can find more yarn for your shawl! That would be frustrating if you couldn't find it. That braided scarf pattern is really pretty! This is a good time of year for reading. Definitely try making rhubarb jam this year! I've made about 8 different types of jam and this is my family's top fav – even better than strawberry or raspberry! It comes out slightly tart like a marmalade. Yum. I love the color of that yarn in your photo — just lovely. I have plans to use up some "stash" yarn in 2013. I have some striped projects in mind so that, I hope, I can just make stripes of one color bigger or smaller to accommodate the amounts of yarn I have and not need to buy more.